I know, I know, all the above descriptors are ways to describe a very busy little boy, so I know better than to put William at the kitchen table to do math work. He has the discipline to sit to do learning activities, but I feel like when he goes to school that so much of his education will be seat work, that I just want to have fun with him…while still teaching him a thing or two along the way. So, I came up with this beanbag toss game to help reinforce William’s counting and number identification skills. Recently, I had found myself at a local craft store. The kind that has old plastic flower wreaths handing in the windows with a heavy layer of dust on them. You know the kind. But while I was shopping I found two inch square cubes for only ten cents a piece, so I bought six to make various sets of dice. For this activity I used a white marker to draw counting dots on the dice. I used one to four dots on each side. William has definitely mastered one to one correspondence up to the number three, but once he gets to four, he still mixes up the dots he has counted with those he hasn’t. So I thought the combination of mastery with the practice of a less familiar number would help keep this game fun and not too difficult. (Turns out that William is pretty good at counting dots to five, so I’ll tweak the difficulty next time). I then used 5×7 inch blank index cards to write the numerals one through four on them and used contact paper to adhere them to the wood floor. Since we were only working on four numbers, I made duplicates so there were two of each focus numeral in the circle. And I got out our bucket of beanbags I’d previously sewn just for learning activities like this one. To play the game, roll the dice. Count the dots. Find the matching numeral. 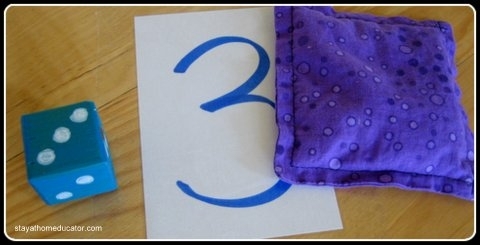 Throw the beanbag onto the matching numerals. Continue until all the numerals have been covered by beanbags. This game can easily be modified if beanbags are not handy. In fact, you may find that your kiddie might ditch the original game and develop one of his own. 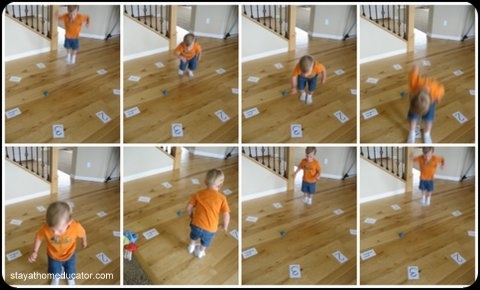 William began walking from number to number, saying the numeral name out loud as he stepped on it. That morphed into hopping to each number while saying it’s name. 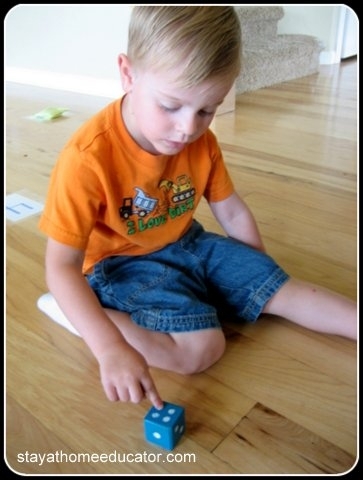 The final version of the game ended with William rolling the dice, counting the dots, then finding the number on the floor and hopping back and forth between the two matching numbers. 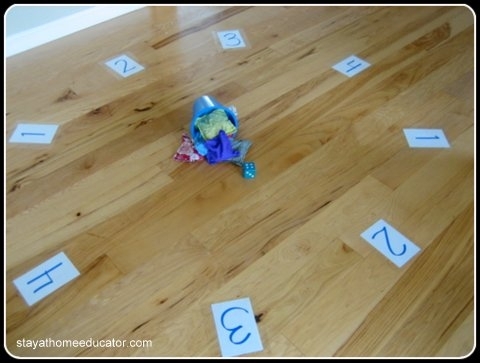 Another variation of this game is to provide your child with counters, like buttons, dry pasta, or large bolts and have him roll the dice and count the dots, then count the same number of counters to place on top of the matching numeral on the floor. 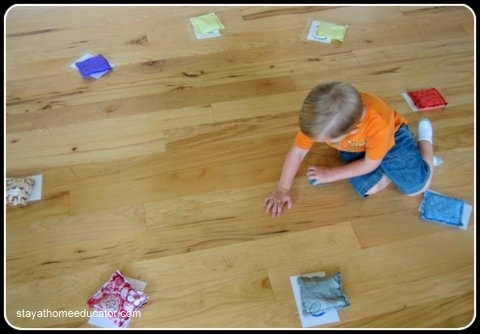 The contact paper will not leave a reside, so leave it down for a while and see what new games you can create from these simple materials. I’d love to hear your variations! 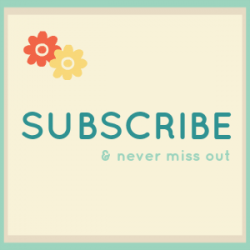 I am just hopping over from my Enchanted Thursdays Blog Hop to thank you for lnnikig up this week! I too love being able to tailor the kids education around their favorite characters. 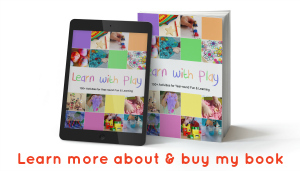 Thank you for all of the great ideas and for including all of the links as well! I hope to see you link up again next week! This is a great idea! 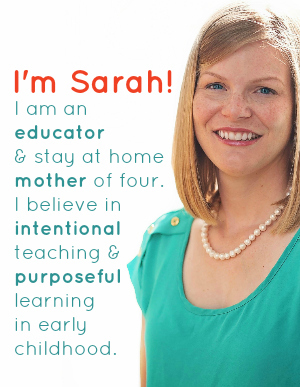 I teach a 2- and 3-year old pre-school class, and I can’t wait to try it out with them!